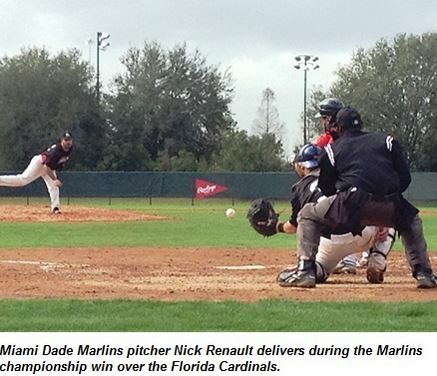 Nick Renault and Leandro Cespedes threw a combined shut-out as the Miami Dade Marlins defeated the Florida Cardinals 4-0 to claim 18-and-over gold at the MSBL’s Holiday Classic at Disney over the Martin Luther King day weekend. Second baseman Norbert Susuni banged out a two-run homer in the sixth inning, and center fielder Max Johnson had three hits to lead the Marlins’ offensive attack. Catcher and designated hitter Manny Reyes was 7-for-14 on the tournament. Cespedas threw the final two innings of the game and so did not qualify for the save, but stats aren’t what manager Paul Guelmes was most interested in – wins were. “It was an excellent team effort,” Guelmes said. He praised the glove work of Jimmy Efre in left field and Siby Vizoso at first base, and added that the team made the most of its offensive opportunities. The Marlins outscored opponents 49-5 during the tournament. Renault’s strong outing wasn’t the only one of the tournament. Eddie Aucoin threw a complete-game four hitter in the Marlins 15-1 goosing of the Tainos Indians in round robin play. Samuel Taveras and Willy Contreras also threw well for the Marlins. Lester Trimino was named the team’s tournament MVP for his inspirational play at third base, according to Vizoso. “Great group of guys, unselfish play, good chemistry,” he added. “Special thanks to Manager Joe Alvarez and player-coach Paul Guelmes for their leadership during this Tournament,” Vizoso said. After a perfect round robin run, the Marlins knocked off the defending champion Coral Gables Athletics in the semifinal game by a score of 8-1. A base-clearing triple by Alberto “Macumba” Cornier in the fourth inning proved to be the decisive blow in that game. Melvin Mancebo struck out 10 batters and earned a complete game semifinal win. Mancebo also hit a monstrous homer to left field in the sixth inning of the final round robin game.